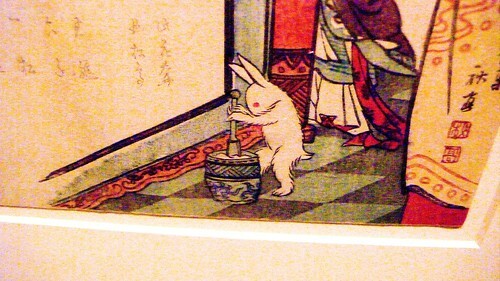 While Western culture typically reports that there is a man in the moon, the Japanese envision a rabbit hard at work making mochi. I have to say it. I definitely don’t see a dude and, as in those optical trick posters, now that the rabbit is pointed out to me, it’s all I can see. This is pretty much how I see it, except I give the moon its propers and contend that the circular shadow next to the rabbit ears (see Exhibit A) is the moon represented … in its own picture, a little meta moon. I believe I first encountered mochi wrapped around ice cream at a Japanese restaurant in the States. I cringe thinking of my reaction. I was a pre-teen who wanted ice cream, not glutenous rice paste. I was daft. After trying it (daft but not stubborn), I peeled the mochi off and ate the, I believe it was strawberry, ice cream from the center. Now, one of my favorite ways to enjoy mochi is wrapped around ice cream. However, I must warn those who have yet to look for mochi in Japan: I have never seen mochi-wrapped ice cream on a menu at a Japanese restaurant. In America, they serve it at swanky restaurants, in Japan you can find it in vending machines and grocery stores. Here is some mochi and ice cream at an American Japanese restaurant. I think the flavors pictured here are (from left) mango, vanilla, strawberry, macha, and sweet red bean. In Japan, I have only found boxes of individually wrapped vanilla, strawberry, and macha. Before I could read the Japanese, I knew the ice cream came wrapped in mochi because rabbits were pictured on the box pounding their little rabbit fists into a mortar or three of them were using a gigantic mallet together. This is also part of the appeal. I’ve moved on from ice cream, becoming somewhat of a mochi purist. I enjoy mochi that is flavored, with macha pounded into it for example, but I like to savor it, enjoy it’s bubble gum stretchiness and waferesque dissolution. 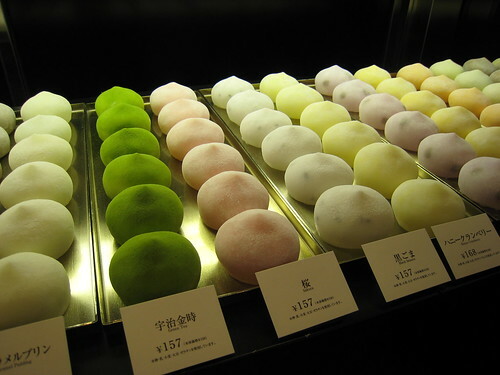 At a sweets shop in Japan one can find this kind of mochi for mochi’s sake in an assortment of flavors and shapes. Sweets are often given as gifts of thanks and upon entering someone’s home for the first time. Mochi is one of the most popular gifts of this kind. I believe the moment that my appreciation for mochi grew into reverence occurred in Kyoto. The heavily trodden walkway to the great Kyomizudera temple is full of sweet shops and craft storefronts. Sightseeing in the wonderland of Kyoto had made me forget to eat, drink, or blink all day. So when sampling one woman’s cinnamon and macha flavored mochi folded over a dollop of sweet red bead paste with a sprinkling of soy flour I nearly cried. I put my hands up and looked at the sky, my first day outside of Shawshank. Regrettably the neighborhood surrounding Kyomizudera is the only place you can acquire yatsuhashi, this specifically divine mochi. While I wait for my next opportunity to purchase a pre-giftwrapped box of 30 pretending I will bring it to my co-workers as omiyage (souvenir) when really my plan is to eat it all three paces outside the shop, I sate my mochi needs at the convenience store. Due to high mochi consumption, convince store mochi is always fresh, cheap, and delicious. I recommend it with warm barley tea and a big, happy sigh. i just ate the most delicious mochi-omiyage that i have had yet: chocolate and goma. yum! Mel, you’ve reminded me of the warabi mochi I ate in Okazaki a few years ago. A truck puttered through the neighborhood regularly, blasting the warabi mochi song: Wa-ra-bi mo-chi! [pause} war-ra-bi mochi! [pause] su-mi-tai! Oishi! It was cold and sweet for the summer days. And yes, I know what you mean about the smooth babycheeked and chewy texture. Wonderful. We just got back from Hawaii, where mochi is huge. Well, it’s normal sized mochi, but . . . aw, you know what I mean. My favorite: mochi wrapped macadamia nuts rolled in powdered cocoa accompanied by locally grown Hawaiian coffee. Mahalo.